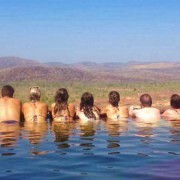 You are here: Home / Our Blog / Featured / Australia / The Ultimate Trip to Darwin, Litchfield and Kakadu. The Ultimate Trip to Darwin, Litchfield and Kakadu. 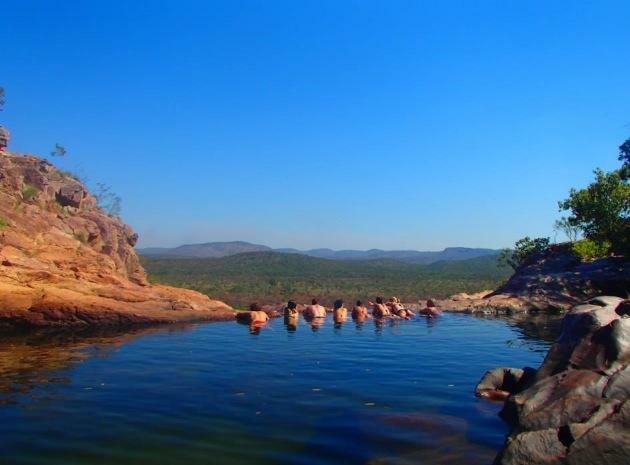 One of our awesome Ultimate Travel gurus Holly Walker recently had the trip of a lifetime to the Northern Territory. Flying to Darwin from Sydney, Holly took part in a 4 wheel drive Dragonfly dreaming tour with Wayoutback Australian Safaris. In Darwin, Holly stayed in the Youthshack hostel before heading into the national parks of Kakadu and Litchfield. Here is a rundown of what she did…. You flew up from Sydney to Darwin, which must be great this time of year as we are just heading into winter but they are just going into dry season? It was brilliant timing! I left Sydney on a Wednesday and flew the 4 and a quarter hours to Darwin. The weather was absolutely amazing during the day (30-35 degrees) but it did rain for a couple of hours overnight. It’s just coming into dry season so it should stay dry for the next 5-6 months so now is the perfect time to head north. After you arrived in Darwin and got checked in to your hostel, I hear you did something awesome before the tour even started? You heard right, this isn’t normally included on the tour but if you were to spend a day either side of the tour in Darwin you could easily fit it in and it was incredible! We visited Crocosaurus Cove for a ‘Cage of Death’ crocodile experience. This is pretty much as terrifying as it sounds but it is a once-in-a-lifetime opportunity to swim with saltwater crocodiles! We got into our swimming gear and tried to keep down the butterflies that were careening around our stomachs and headed into the cage! This involved being lowered into the water in a tank to get up close and personal to the ‘Kate and Will’ two of the resident crocs at Crocosaurus Cove. That sounds amazing and terrifying all at the same time! What did you do on that first evening, did you meet up with your group? Yes, we all got together in the evening and we visited Mindil markets in Darwin to have a look around the numerous food, jewelry, trinket and aboriginal art stalls. We chilled on the beach with a few drinks, eating food from the markets whilst watching the amazing Darwin sunset. Honestly, I’ll never forget that sunset it was truly spectacular. The way the sun dipped into the ocean was like something out of a bad romantic comedy. I took about 400 photos of it so it looks like a flick-book when you go through my Facebook album! The next day, your big trip began. Can you give us an itinerary of what you did? We started off the tour in Litchfield National Park exploring waterfalls such as Florence and Wangi falls. We also went to see some termite mounds between swims which was pretty cool. We stopped off for lunch at a permanent campsite before heading to an indigenous cultural centre (a wooden construction with a cloth over the top for shade), here our aboriginal guide Graham talked us through the aboriginal history and culture. He told us stories of ‘dreamtime,’ which is the name for the Aboriginal belief system and he discussed the way of life in aboriginal communities. We were also shown basket weaving and spear throwing. We arrived at our campsite in the Mary River region early evening for dinner, a good old fashioned BBQ, and spent the evening searching for local wildlife, having a few drinks and counting shooting stars which was absolutely beautiful. The next morning we went on cruise of the a Mary River wetlands. The wetlands are made up of lagoons, canals and billabongs. We saw crocodiles in their natural habitat, as the Northern Territory has the highest concentration of saltwater crocs in the world, a vast variety of birdlife (trying to not be eaten by the crocs!) and lots of beautiful scenery and flora including the beautiful water lilies and lily pads. We then did some 4 wheel driving along the dirt tracks in Kakadu National Park which was immense! We reached Gunlom falls and hiked up to the top of the waterfall before spending the next few hours relaxing in the infinity pool and other plunge pools overlooking Kakadu. We then headed towards a different campsite to spend the night. Both campsites are permanent with access to hot showers and toilets. All tents were permanent and equipped with beds. We started off the last day by taking a short hike up to Nawurlandja lookout overlooking Nourlangie and Anbangbang Billabong. We were then given the option of taking a scenic flight (at own expense) over Kakadu National Park to check out Jim Jim and Twin falls before heading to Ubirr for lunch. At Ubirr we viewed a wide range of ancient aboriginal art and rock paintings which were interpreted by our guide. This was quite a unique experience, having someone who was able to tell us what these paintings mean after thousands of years was a really powerful moment. We hiked up to the Nadab lookout for panoramic views over the floodplains and into Arnhemland. En route back to Darwin we stopped off at the famous ‘Humpty Doo Hotel’ for a drink to end our top end tour. Wow. That sounds absolutely awesome! It’s crazy how much you can fit in one trip! I know it’ll be difficult but does anything stand out as your favourite bit? Gunlom falls infinity pool is like nothing I’ve ever seen. It is a natural rock formation that has to be seen to be believed. Sitting in the cool waters looking out over a the breathtaking view is something I’ll never forget. The photos look awesome on Instagram too! The Mary River wetlands cruise was great as well, seeing those crocodiles and imagining what was going on beneath the surface! The stargazing at the campsites (I’ve never seen so many stars!) was incredible too. Kakadu and Litchfield are some of the least populated areas of Australia and you really get a feeling for how vast the country is when you are alone with your group in the middle of nowhere! Nadab lookout overlooking Arnhemland was awesome too and the sunset at the Mindil markets in Darwin was also amazing. As you can tell, it was a trip with a lot of highlights! It sounds like it! Did anything surprise you? Did you enjoy anything more than you thought or was it all as you expected? I was surprised how big Kakadu National Park actually is, it is as big as country (Slovenia, to be precise). You can drive along the dirt roads for hours without seeing anyone else! I also realised how little I knew about aboriginal culture and learnt lots of interesting facts from the aboriginal cultural centre we visited. I was shocked driving past bush fires at the side of the road and to learn that parts of the national park are burnt by local aboriginal communities to maintain the land as well as being caused by the dry heat within the national parks. I know you mentioned the crocodiles but you must have seen some other cool wildlife while you were in the outback? I saw lots of crocs in their natural habitat which was awesome. I came across loads of frogs and toads, a huntsman spider, some wild donkeys and a random albino buffalo! We also spotted two owls at the first campsite we stayed at and I accidentally ate a mosquito (its family nearly bit me to death after that). All in all there was lots of interaction with wild animals and insects! https://www.ultimate.travel/wp-content/uploads/2014/06/kakadu.jpg 465 630 Ultimate Travel https://www.ultimate.travel/wp-content/uploads/2015/01/logo-300x94.png Ultimate Travel2014-06-10 23:40:472014-06-06 00:38:14The Ultimate Trip to Darwin, Litchfield and Kakadu. Shark vs Crocodile! Only in Australia! Kakadu, Crocs & Australia's Northern Territory! Fantastic,travel blog.Most tourists go and visit the east coast of Australia but never visit Northen territory This is where Australia really shines and travellers will be shell shocked because of northern territories immense beauty.